So a few weeks ago I met my family in Vienna for a weekend of culture and indulgence. Thankfully, my parents and their friends allowed me to arrange the "indulgence" part. I had never been to Vienna before so I asked some friends where would be the best place for dinner. One of the suggestions was Fabios, and although I was a bit unsure at first, I couldn't be more pleased with the decision to have dinner at this Italian place. First of all, the odds were a bit against us, because 1) it was Valentines date night 2) Fabios seemed like a real hotspot and not the type of place where you just 'walk in' for dinner and 3) we were a group of 8 people. BUT luck was on our side and after waiting for a little while our table was all set and ready. I like to think it was meant to be. We started with some fresh, crunchy bread & olive oil. The bread was cut on a little bread station right next to our table and it smelled so good. 10 points for the fresh Austrian bread! My sister and I decided to share a starter, one of my London favourites: tuna tartare with avocado and cucumber. A heavenly combination which, when done right, tastes divine. And it did. The zingy lemon zest inside gave a fresh touch in all that creaminess. My dad choose some aubergine-tomato dish which was so full of flavour and just perfect! Even the cherry tomatoes tasted like the freshest plump little things right from the garden. I love good Italian food because it's always simple but with fresh and good quality ingredients. No need for it to be complicated. You know the food is good when you mop up the sauce with bread..
As a main I chose ravioli filled with veal and spinach with a sage & butter sauce. Without exaggerating, this is the best ravioli I have ever eaten. 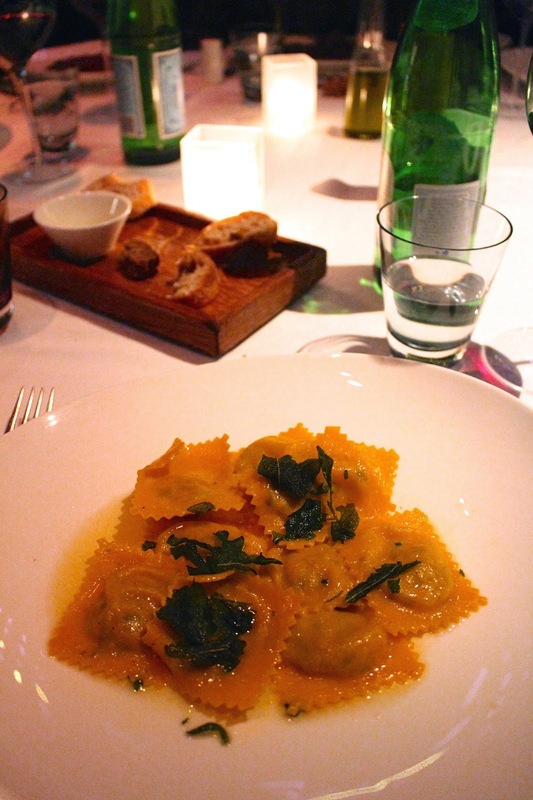 All the flavours were amazing and it just about the right amount (ravioli can be a bit heavy). My sister also agreed that this was some amazing ravioli. A must-try when you're in Vienna! My sister opted for a steak with potato puree. 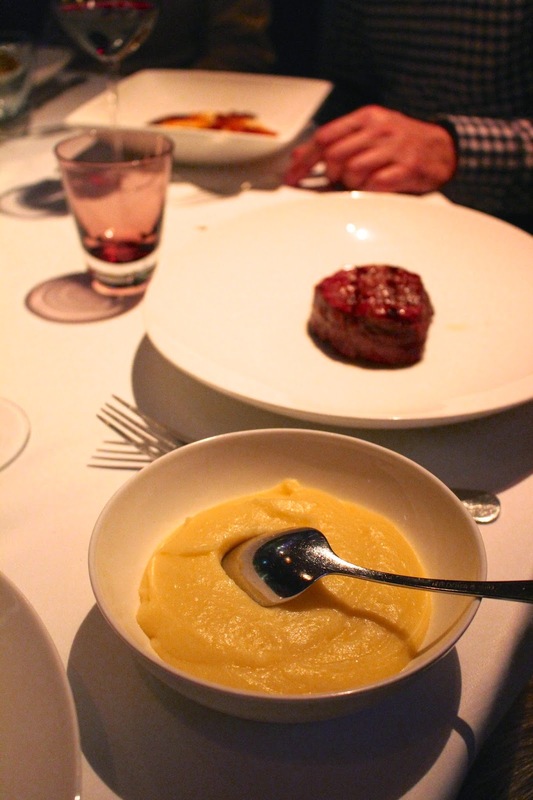 While the steak was good but nothing special, the puree was out of this world. Smooth, creamy and the perfect flavour. It's comparable to the puree at Cafe Ruc in Paris, in case you've ever been. So good! So overall, all the food we had was super tasty, fresh and great quality. Everything you can wish for in Italian food! Even though the restaurant looks 'hip' and 'trendy', the food really lives up to it and outshines everything else. Oh and the toilets are pretty cool too.. I can recommend Fabios 100% to anyone who's going to Vienna! This city pleasantly surprised me just like this restaurant. I couldn't have wished for a better Valentines: good food and great company is all you really need. I'll be back soon hopefully! Check the restaurant info here.